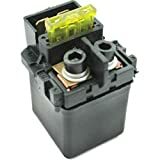 New Starter Relay Solenoid Motorcycle Part Fit For Kawasaki ZX600 NINJA ZX-6R ZX6RR 1995 1996 1997 1998 1999 2000 2001 2002 2003 2004 2005 2006 2007 2008 2009 2010 (UPC 532045794892) is sold at the following online stores. We've find the latest prices so you can compare prices and save money when making your purchases online. Please click on the links below to browse to each store's webpage.